Forget the burnouts and the aggressive V8 growl, the Dodge Challenger SXT and GT models are mini-muscle for the modern age. All models are powered by a 3.6-liter V6 engine developing 305 horsepower, directed through an 8-speed automatic gearbox as the only option. SXT and SXT Plus models are rear-wheel drive only, but the GT model adds all-wheel drive for the first time ever. The Driver Convenience equipment group includes remote start, HID headlamps, and blind spot monitoring. 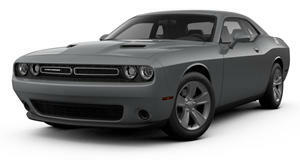 Other available safety features include forward collision warning that earns the Challenger 5/5 stars from the NHTSA. What’s a muscle car without a V8? For many it’s a farce, heresy, sacrilege, and a disgrace to the very heart of the muscle car. But in a world where drivers are starting to value precision driving dynamics over power, these non-V8 muscle cars may have a place. But what if it’s a Dodge Challenger? Can the V6 powered SXT, SXT Plus, and GT models live up to the ethos of the Challenger? And when further up the ladder you get a Hellcat and a Demon, are these ‘light’ muscle cars even worth your consideration? Considering the Charger is a coupe, there’s vastly more space available in here than other rivals. Once you climb in through the wide-opening heavy doors – which can be problematic in tight spaces – there’s a wealth of head-, leg-, and shoulder room. The cloth seats (Leather is available on the SXT Plus and GT) offer a lot of space, particularly for broader drivers, and they’re set in a cabin with a simple, easy to use layout spearheaded by the Uconnect touch screen infotainment system. But some of the dash materials do feel somewhat cheap, though panel gaps are consistent and nothing feels overtly like it’s going to break. Rear passenger space is the one aspect where the Challenger dominates its rivals – offering enough space for adults, and with a proper three seat configuration. The rear bench also folds in a 60/40 split, expanding a class leading trunk even further. With all seats in place, there’s still 16.2 cubic feet available. On these lesser Challenger models, higher profile, smaller tires assist the ride compliance, though at the compromise of handling prowess. The softer tires combine with the suspension to create a firm ride, but one with a depth of ability when it comes to dealing with small bumps. Secondary ride is impressive, though over rapidly changing surfaces, the dampers don’t quite keep up and the ride can become quite busy. Through corners, there’s a bit of body-roll – the Challenger is a heavy car after all, but the levels of grip are impressive, even on the rear wheels as they seldom get overwhelmed by the engine. But the GT model offers more – and yet is less muscle-like – for the addition of all-wheel drive. This doesn’t change the ride much, but adds an extra layer to the handling ability, and adds more grip in poor weather conditions. The steering on all models is responsive, and changes of direction are dealt with deftly. 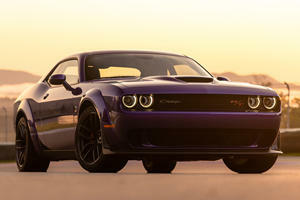 Muscle is traditionally V8-powered, but these base Challenger models derive their drive from two fewer cylinders. A 3.6-liter Chrysler Pentastar V6 lies under the hood, developing 305 horsepower and 268 lb-ft of torque. The only gearbox option is a ZF 8-speed automatic, but there are two choices of drivetrain. 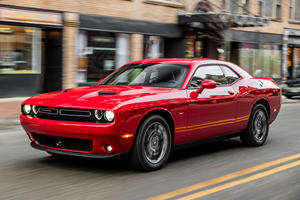 The SXT and SXT Plus models are rear-wheel drive, but the GT adds drive to the front axle for the only all-wheel drive Challenger in the line-up. For those who hunger for a manual shifter, hard luck = you’d need to get a V8 variant if you wanna row your own cogs. The SXT trim is the base specification, but still features keyless entry, dual-zone climate control, 6-way power adjustable driver’s seat, and a rear-view camera. 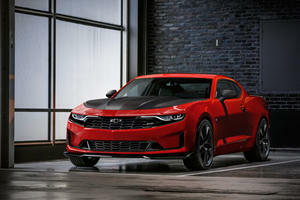 The Plus version is an extended variant of the SXT, adding a larger 8.4-inch touch screen, rear park sensors, 20 inch wheels, and leather upholstery with heating and ventilation. The GT AWD is based on the SXT Plus, but adds a heated power steering wheel, and all-wheel drive. Traction control and electronic stability control are standard on all models, with the Technology Group including forward collision warning and adaptive cruise control. A V6 muscle car with all-wheel drive – the notion is sheer insanity. Yet the entry specification V6 Challenger is actually a decent drive – if not genuine muscle. If you’re going for sacrilege, you may as well jump all in ad get the GT AWD, which also happens to be well-equipped. The American coupe is in good company. After losing to the Challenger and Mustang, Chevy wants to be back on top.